In cats the calico pattern consists of three colors -- orange, black and white, which occurs almost exclusively in females due to the genetic markers. In rabbits, however, the same three-color combination can occur in both males and females, or bucks and does respectively, and in nearly every domestic breed. The color referred to as calico in cats is called tri-color or broken tri-color in rabbits. The word broken doesn't mean that there is anything wrong with the rabbit, but alludes to a pattern in which the color is broken up by patches of white fur. In the case of a tri-color, the broken pattern involves three solid colors: orange, black and white. Just like calico cats, some tri-color rabbits are mostly white with only a few spots of orange and black, while others have more black and orange coloring with only a few patches of white. Harlequin is both a color and a breed in rabbits and is similar to tortoiseshell in a cat, which is sometimes mistaken for calico. A harlequin-colored rabbit is orange and black, without any patches of white. The colors may or may not be distributed in an alternating pattern, except in the case of the Harlequin breed, and then they alternate in rectangular patches over the head and the body. The harlequin color is used in combination with other broken patterned rabbits to create a tri-color. Tri-color rabbits can be found in nearly every breed that includes broken color as an acceptable fur pattern, but it is uncommon in many of them. 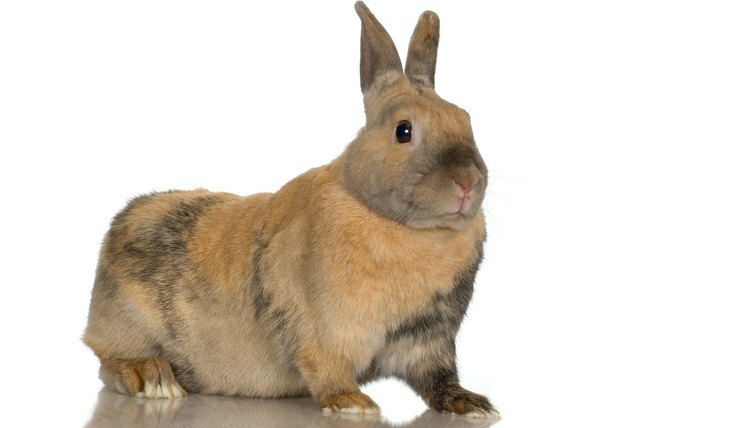 Among the most popular breeds that can be found in tri-color varieties are the Holland Lop, Mini Rex, Rex, Lionhead, Mini Lop, Satin, Mini Satin, English Lop and French Lop. Although tri-color is found in these breeds, it is not necessarily accepted according to the breed standard. The Rhinelander is the only breed of rabbit that is exclusively tri-color, or calico. These rabbits are bred in part for their unusual coloring and pattern, which includes a mostly white body with an orange and black butterfly, or nose marking, as well as a line of both colors along the spine and an even scattering of black and orange spots on the hips. Rhinelanders are not as popular as many other breeds, in part because it is difficult to achieve the correct color pattern and it has a hare-like body shape that doesn't lend itself well to meat production.